The Taurus 2 rocket's Russian first stage main engine passed a preflight acceptance test Friday at the Stennis Space Center in Mississippi, according to NASA and Orbital Sciences Corp. The engine firing was the second of three tests planned to verify its readiness for launch. 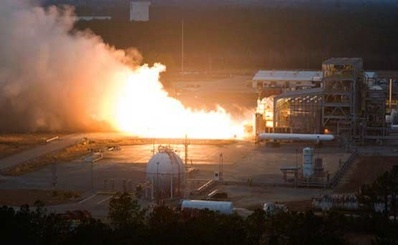 The first Taurus 2 flight is scheduled for the second half of 2011 from Wallops Island, Va.
"The test of the engine's primary control functions accomplished all primary objectives, including engine startup, valve commanding, thrust vector control and shutdown sequence," Orbital posted on its website. "Preliminary review of the test data indicated that all test objectives were met." It was the first AJ26 engine test to exercise its thrust vector control system. The gimbal mechanism will steer the Taurus 2 rocket during the first stage burn, which lasts nearly four minutes on a standard launch. The Taurus 2 rocket is being developed by Orbital to launch the Cygnus robotic resupply spacecraft to the International Space Station. Operational cargo flights of the Taurus 2 and Cygnus are due to begin in early 2012. "Once again, the Orbital and Aerojet team have achieved a major milestone with the AJ26 engine," said Doug Cooke, associate administrator for NASA's exploration division. "This success moves Orbital closer to its goal of providing NASA with commercial space transportation services to the space station." The AJ26 is a kerosene-fueled engine modified by Aerojet from the Russian NK-33 powerplant. Each Taurus 2 rocket first stage will be powered by two AJ26 engines. Kept in storage for four decades, the NK-33 engines were originally designed and built in the 1960s and 1970s for the ill-fated Soviet N1 moon rocket. Aerojet converts the NK-33 to an AJ26 engine by removing some harnessing, adding U.S. electronics, qualifying it for U.S. propellants, and modifying the system to gimbal for steering, according to company officials. Another AJ26 firing in mid-January will check the tuning of engine control valves. The NK-33 has been test fired in Russia to ensure the engines remain in good condition after being stockpiled for so long. NASA modified the E-1 test stand at Stennis to support AJ26 acceptance testing, and Orbital plans to route every flight-ready AJ26 engine through Mississippi before shipment to the Taurus 2's launch site in Virginia.